The small form-factor pluggable (SFP) is a compact, hot-pluggable transceiver used for both telecommunication and data communications applications. The form factor and electrical interface are specified by a multi-source agreement (MSA) under the auspices of the SFF Committee. It is a popular industry format jointly developed and supported by many network component vendors. The SFP interfaces a network device motherboard (for a switch, router, media converter or similar device) to a fiber opticor copper networking cable. 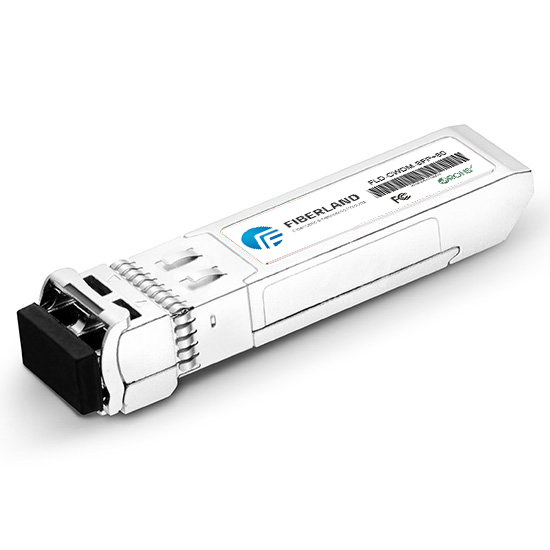 SFP transceivers are designed to support SONET, gigabit Ethernet, Fibre Channel, and other communications standards. Due to its smaller size, SFP obsolesces the formerly ubiquitous gigabit interface converter(GBIC); the SFP is sometimes referred to as a Mini-GBIC. In fact, no device with this name has ever been defined in the MSAs. Many manufacturers restrict their devices to accept only original SFP modules of the same brand, as identified by their vendor ID. Due to sometimes significant price differences between original and generic modules, there is a large market of "compatible" or "third party" modules that are programmed to show the appropriate vendor ID. It is possible to design an SFP+ slot that can accept a standard SFP module. Some routing and Ethernet switch equipment allows for the use of a 10 Gbit/s transceiver at lower gigabit ethernet speed, such as with a 1 Gbit/s 1310 nm LX SFP.